Blackwind Adventure Team: Why we like 4x4 ? Why we like 4x4 adventure?May be because the adventure, the vehicle, result and performance of your 4x4 modification, the mother nature challenge or it can be many thought BUT to experience it is to own it. My first thought about 4WD is that it just meant for people who works in construction field who always require suitable vehicle to carry their heavy load or equipments. Furthermore, in Malaysia the road tax for this kind of vehicle is tremendously high especially those with diesel engine. When my friend bought a secondhand 4x4, I asked him why you need this vehicle for? The answer is just to experience the fun of riding 4x4. Good answer but is he financially prepare for the high maintenance, daily fuel consumption, road tax etc. Then, one day I was invited to join the off road adventure event and start to love it. A month later, I bought a my first 4x4, a Mitsubishi Pajero LO49 1991 Model with diesel engine. For first time I was amazed how useful this vehicle are, you can carry heavy loads, long endurance and for me with 5 kids, this vehicle is also suitable for family use or trips. You don't have to worry about the road anymore, on road or off road not a problem. I am also lucky because the Malaysia government has reduced the yearly road tax, diesel price and for monthly maintenance 'DO IT YOURSELF'. 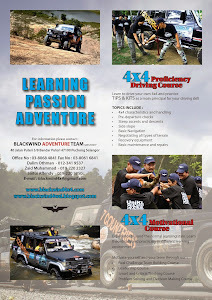 Now we have our own workshop, mechanic, club house and last December 2008, BLACKWIND has joined as a Team Media in the Rainforest Challenge Malaysia 2008 (RFC), the most challenging 4x4 off road adventure event in the world. A very good experience and we have gained a lot of information about off roading, vehicles handling techniques, environment, team spirit etc. Next year, we aimed to join again in the RFC but not as a Media Team but as a challenger in the RFC.